Opened in 1953, Dan Hotel Tel Aviv was the first luxury hotel in Israel and has maintained its status as the “Grande Dame” of Tel Aviv hotels ever since. Part of a 14 hotel chain operating in Israel, the Dan Tel Aviv hotel is in a category of its own in service and opulence in the Israeli hospitality industry. The hotel exudes luxury inside and out – the front of the hotel that faces the Mediterranean Sea is painted by famed artist Yaakov Agam and changes colors depending on the time of day, while the interior of the hotel has an art-deco theme with black and cream colors and gold accents, with statues and paintings throughout. 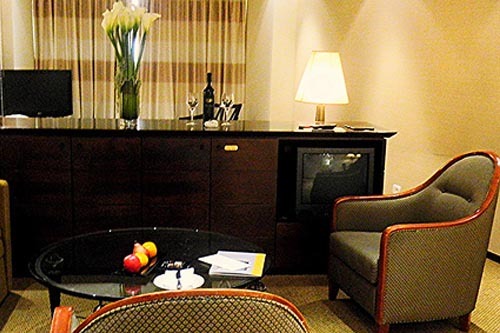 Located in the heart of the city, with views of the Mediterranean Sea and next to the gorgeous sandy Bograshov and Frishman beaches, the hotel caters to both families and business travelers seeking added comforts away from home. The Rooms The Dan Hotel Tel Aviv has 280 rooms, including 84 Executive Sea View rooms, 41 luxury suites, one Presidential Suite, and one Royal Suite. Connecting rooms are available for families or larger groups traveling together. The extra-large rooms are designed with muted light colors, giving the room a fresh, modern look. The rooms are also designed with functionality in mind, with full wall mirrors on the closet doors and bathroom, as well as over 24 lights around the room alone, making it an incredibly well-lit space. A central control allows you to switch with ease between heat and air conditioning system anytime and the A/C vents are placed so that they cool the room without blowing directly on bed area. The room boasts a gigantic four paneled closet that can easily accommodate an entire family’s belongings, with plenty of shelves and hanging space, including clothes hangers The room is split into two sections: a sitting area with a foldaway sofa and the bed area both equipped with TVs (so the kids can watch their channels while the adults can enjoy their own programs). I was slightly nervous about the quality of sleep I would get because the room was on the first floor of the hotel, facing a very busy street with construction, but I was amazed that I couldn’t really hear the noise outside at all. The room was like a serene oasis that separated me from the sensory overload going on outside. The windows even have double curtains to block out the light, for those who might be light sensitive. I was glad to notice that The Dan Hotel Tel Aviv doesn’t have balconies, only windows that open partially with locks that are not easy for little ones to open. The Bathroom The bathroom is also well-lit, with marble flooring and granite countertops. The large bathroom is designed with multiple family members in mind, as there are actually two areas, separated by a door: a tub-sink-bidet area and a sink-toilet area. The bathroom offers two shower heads: overhead and a handheld one, anti-slip tub floor; three grab bars and a partial glass door making accessing the tub easier for disabled adults and for parents of young children.The fluffy towels, bathrobes, slippers and well-stocked amenity kit made me feel incredibly pampered. Extra touches The electronic door button enables you to communicate with housekeeping service about whether you need the room cleaned or prefer to not be disturbed. Both night stands have controls for the room lights and phones so you don’t need to get up or disturb your sleeping partner. The Food The Breakfast is a feast that is not to be missed! 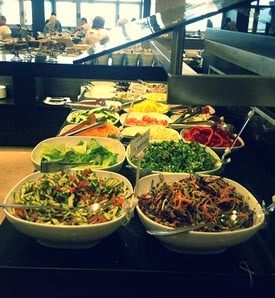 Even in comparison to the elaborate breakfasts I’ve seen in Israel, this one stands out in choices and superior quality. Besides the daily baked bread and freshly squeezed juices, the buffet provides an impressive assortment of freshly cut vegetables and salads. Particularly noteworthy were the Quinoa salad, the stuffed grape leaves with Labane (a yogurt-based cheese), and toasted Bourekas (a pastry filled with cheese, spinach or potatoes). The breakfast buffet offers multiple egg choices including Benedict style and Huevos Haminados, which are eggs slowly boiled with tea leaves or onions. If you are staying at the hotel over the weekend, make sure you book a spot at their incredible Shabbat dinner. 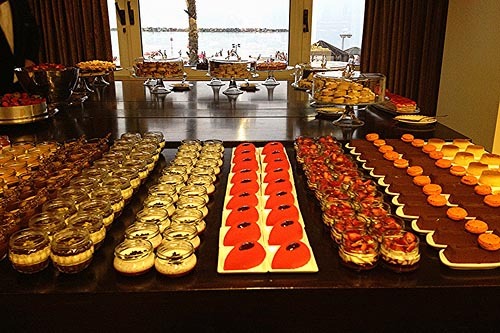 It is held in an elegant dining hall overlooking the beach (and unforgettable Tel Aviv sunset), and features traditional dishes like Gefilte fish, beef tongue stew, and leg of lamb, with a center table display of different challah breads and cold cuts. The dessert spread offers a assortment of cakes , fruits and mousses. Hotel Amenities The hotel has an indoor and outdoor swimming pool, spa (for an extra charge), and gym as well as the Dan Hotel chain’s signature Danyland. Danyland is an entertainment club for kids tthat caters to the diverse age groups. The mural-adorned large room has numerous age appropriate play stations, including a soft floor and cubes for babies and toddlers. Hotel guests can use Danyland as often as they wish, and it is free, though parental supervision for children under 3 years old is required. As in all top-notch hotels, service at the Dan is impeccable from the minute you walk through the front door to the moment you leave. Starting with the front desk remembering my name, the ladies at the executive lounge helping with my Wi-Fi questions, the prompt housekeeping service (five minutes or less) and the bellman helping me into the cab when I left –everyone was polite, friendly and always smiling.